One of the best things about the onset of autumn is that you can return to the comforting, satisfying dishes of the colder months. 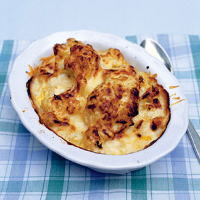 And cauliflower cheese is, of course, the king of comfort food. I like to make sure that there's plenty of oozing sauce that can be mopped up with the slices of roast beef. Heat the butter in a saucepan and add the onion. Slowly cook for 8–10 minutes until soft. Then add the flour, stir together and take off the heat. Meanwhile, bring to the boil a large pan of water and add some salt. Add the cauliflower, return to the boil and cook for 3–4 minutes so it still has a bite. Drain really well in a colander, shaking it to get it to release all its water. Add a good splash of milk, beat until it is smooth, then add the rest, again stirring until smooth. Return to the heat, stir occasionally and bring to the boil – it should be a thick sauce – then remove and stir in 75g Cheddar, mustard and seasoning to taste. Mix the cauliflower with the sauce and transfer to a wide, ovenproof baking dish; the more surface area, the more crispy top you'll get. Scatter with the remaining cheese and place under the grill for 5 minutes until it is bubbling and golden on top.